Immunomagnetic separation (IMS) and immunoassays are widely used for pathogen detection. However, novel technology platforms with highly selective antibodies are essential to improve detection sensitivity, specificity and performance. In this study, monoclonal antibodies (MAbs) against Internalin A (InlA) and p30 were generated and used on paramagnetic beads of varying diameters for concentration, as well as on fiber-optic sensor for detection. Anti-InlA MAb-2D12 (IgG2a subclass) was specific for Listeria monocytogenes and L. ivanovii, and p30-specific MAb-3F8 (IgM) was specific for the genus Listeria. At all bacterial concentrations (103–108 CFU/mL) tested in the IMS assay; the 1-μm diameter MyOne beads had significantly higher capture efficiency (P < 0.05) than the 2.8-μm diameter M-280 beads with both antibodies. The highest capture efficiency for MyOne-2D12 (49.2% for 105 CFU/mL) was significantly higher (P < 0.05) than that of MyOne-3F8 (16.6 %) and Dynabeads anti-Listeria antibody (9 %). Furthermore, capture efficiency for MyOne-2D12 was highly specific for L. monocytogenes and L. ivanovii. Subsequently, we captured L. monocytogenes by MyOne-2D12 and MyOne-3F8 from hotdogs inoculated with mono- or co-cultures of L. monocytogenes and L. innocua (10–40 CFU/g), enriched for 18 h and detected by fiber-optic sensor and confirmed by plating, light-scattering, and qPCR assays. The detection limit for L. monocytogenes and L. ivanovii by the fiber-optic immunosensor was 3 × 102 CFU/mL using MAb-2D12 as capture and reporter antibody. Selective media plating, light-scattering, and qPCR assays confirmed the IMS and fiber-optic results. 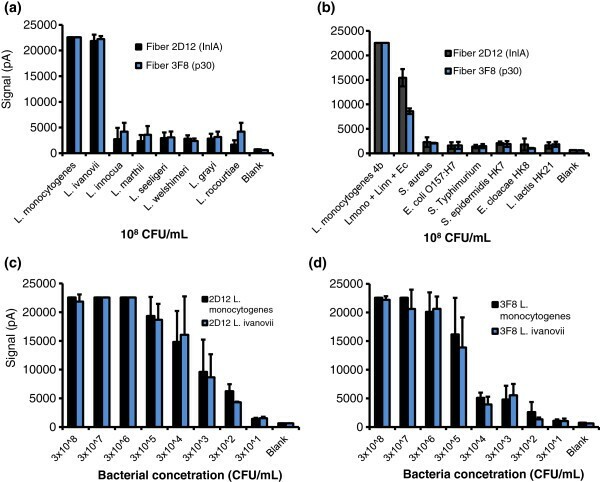 IMS coupled with a fiber-optic sensor using anti-InlA MAb is highly specific for L. monocytogenes and L. ivanovii and enabled detection of these pathogens at low levels from buffer or food. The foodborne pathogen Listeria monocytogenes causes listeriosis—a severe illness that ranges from mild gastroenteritis to invasive infection in immunocompromised people, neonates, and the elderly. In pregnant women, it causes premature births, miscarriages, and neonatal sepsis or fetal deaths. L. monocytogenes is ubiquitous and found in food-processing environments[2, 3] and food products, including ethnic soft cheese[4, 5], sliced lunch meats and frankfurters, and seafood. It has been implicated in numerous food outbreaks and recalls, including a large outbreak involving cantaloupe in the US, which caused 29 deaths and 1 miscarriage. Listeriosis has an estimated 19% fatality rate and ranks third among all fatalities resulting from foodborne infections in the USA. Therefore, many countries have established a “zero tolerance” policy towards L. monocytogenes in RTE foods. Food recalls have increased each year, placing an economic burden on food manufacturers and growers. Rapid and accurate detection methods may alleviate some of these problems. The genus Listeria consists of 8 species: L. monocytogenes, L. ivanovii, L. seeligeri, L. welshimeri, L. innocua, L. grayi, and two new species, L. marthii and L. rocourtiae. L. monocytogenes and L. ivanovii are pathogenic to humans and animals. Many virulence and structural genes or gene products in Listeria could be used as targets for antibody- or nucleic acid-based assay development. L. monocytogenes expresses several virulence proteins, including Internalin A (InlA), which promotes bacterial adhesion and invasion of the host cell. InlA possesses N-terminal leucine-rich repeats that facilitate anchoring to the bacterial cell wall, while the most distal extracellular domain binds to E-cadherin, which is crucial for host cell–cell adhesion and maintenance of tissue architecture. Both pathogenic and non-pathogenic Listeria species can be found in the same environment or food. However, when an enrichment step is used, the non-pathogenic species may overgrow and outcompete L. monocytogenes[17–19], leading to false-negative results. L. innocua is the most frequently found bacteria in Listeria-contaminated foods[17, 20], thus presenting a challenge for the specific capture and detection of pathogenic Listeria. Hence, it is essential to develop methods that are capable of detecting pathogenic species in the presence of non-pathogenic species. Immunological approaches to detect pathogens in food are attractive; however, assay performance depends on the quality and specificity of the antibodies used[14, 22]. For detection of Listeria, two types of assay specificities are desired: Listeria genus- or L. monocytogenes-specific tests. Anti-Listeria antibodies available from research laboratories or commercial vendors are associated with problems of low affinity, reaction to heterologous antigens[24, 25], lack of reaction towards all serotypes of L. monocytogenes[23, 26–28], lack of reaction due to physiological stress induced by growth media or assay parameters[29, 30], and lack of compatibility with certain bioassay platforms[14, 22, 31]. Thus, there is a need for continued efforts to produce high-quality antibodies. The recovery of low numbers of pathogens from complex food matrices also impedes their rapid and sensitive detection[31, 32]. Antibodies are routinely used as affinity ligands to separate and concentrate the target analyte from sample matrices using paramagnetic beads (PMBs)[31–34] and also as recognition or reporter molecules on immunoassay platforms[31, 35, 36]. The PMB-captured cells may be presumptively identified by plating them on selective or differential media, or their identity may be confirmed by PCR[38, 39], flow cytometry, or cytotoxicity assay. The use of a biosensor to detect cells captured by immunomagnetic separation (IMS) is an attractive approach due to increased speed, accuracy, and detection of a low number of targets[34, 42, 43]. Fiber-optic sensors utilize laser excitation to generate an evanescent wave in order to quantify biomolecules immobilized on an optical waveguide[31, 44, 45]. A capture antibody is immobilized on the waveguide and a fluorescent (Cyanine 5 or Alexa Fluor 647)-labeled second antibody is used as a reporter for the target analyte. Once the laser beam (635 nm) travels through the optical waveguide, it undergoes total internal reflection, and the fluorophore on the reporter antibody bound to the analyte is excited, thereby generating an evanescent wave. The signal is propagated back up to the fiber and is detected in real time by a fluorometer. This format has been successfully applied to many foodborne microorganisms and toxins, however, the limit of detection largely depends on the antibody and the reagents used[31, 44, 46–48]. In the present study, monoclonal antibodies (MAbs) against L. monocytogenes and Listeria spp. were generated, characterized, and employed to concentrate L. monocytogenes using PMBs. Finally, MAbs were used on the fiber optic sensor to detect L. monocytogenes from inoculated food products (soft cheese and hotdogs). In parallel, qPCR and light-scattering sensor methods were performed to confirm the results. We selected 11 stable hybridomas, of which 7 (2F2, 2A2, 3B3, 3B7, 4E8, 2D12, and 4E4) reacted with both rInlA and L. monocytogenes cells, and 4 (4E5, 4C1, 2A12, and 3F8) reacted with L. monocytogenes, L. innocua, and L. seeligeri. After another round of screening of MAbs-2D12, -3B7, -4E4, and -3F8 against rInlA or L. monocytogenes cells (serotypes 4b, 4a, 1/2a, and 1/2b) by ELISA, we chose MAb-2D12 (subclass IgG2a) and MAb-3F8 (subclass IgM) for future use. An ELISA (Figure 1a) revealed that, among the anti-InlA antibodies, MAbs-2D12 and -3B7 strongly reacted (A450 = 1.0 or higher) with L. monocytogenes 4b cells, while MAb-4E4 gave slightly lower reaction values (A450 = 0.75–0.9). 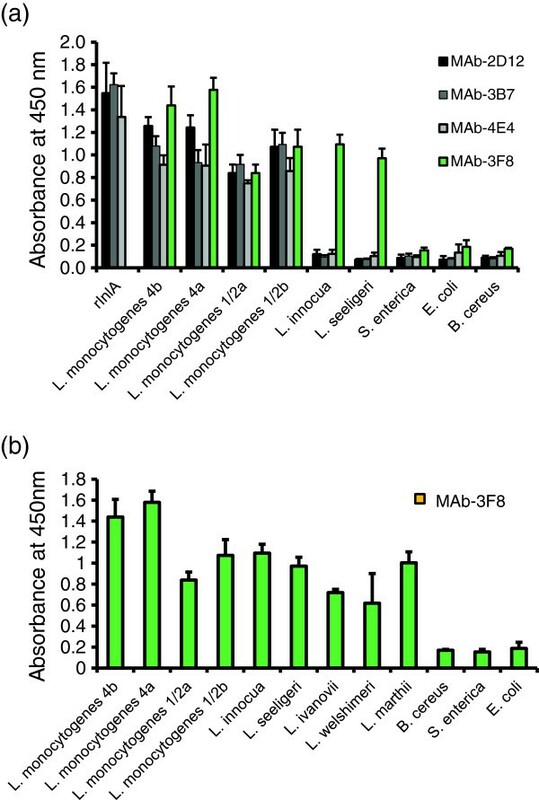 The Listeria genus-specific MAb-3F8 gave strong ELISA values (A450 = 0.8–1.5) when tested against other Listeria spp., without producing significant cross-reactions with other bacterial species (Figure 1b). Indirect ELISA using (a) MAbs 2D12, 3B7, 4E4, and 3F8 or (b) MAb-3F8 against different bacterial strains and purified rInlA. Several 96-well microtiter plates were coated with live bacteria (~1 × 109 CFU/mL) for 16 h at 4 °C. Data are the mean ± SD of 3 independent assays performed in duplicate. 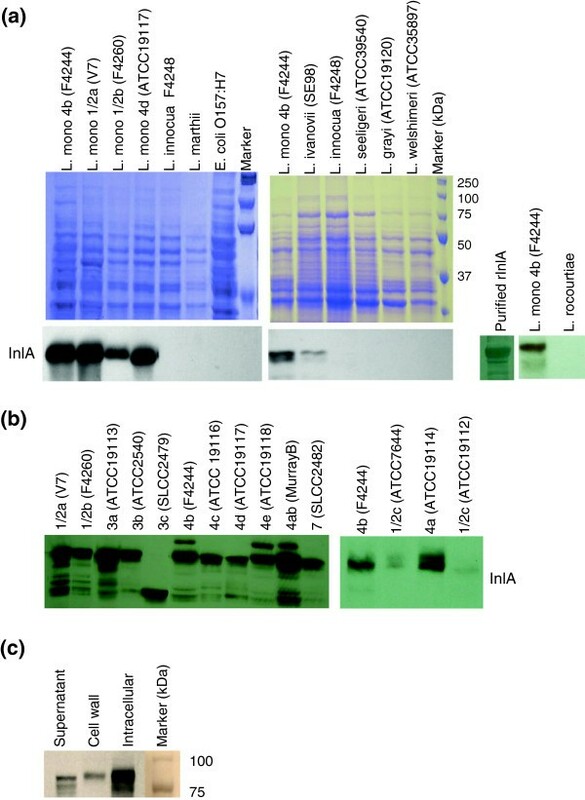 In the Western blot, MAb-2D12 reacted with an 80-kDa protein band (InlA) from L. monocytogenes and L. ivanovii, but it did not react with other Listeria spp., including L. marthii or L. rocourtiae (Figure 2a). MAb-2D12 was reactive with all 13 serotypes; however, a relatively weak reaction with 2 strains of serotype 1/2c (ATCC 19112 and ATCC 7644) was observed. MAb-2D12 also reacted with a 66-kDa band from serotype 3c (SLCC 2479), which is presumably a truncated InlA-protein variant (Figure 2b). MAb-2D12-reactive InlA was distributed in the secreted, cell wall, and intracellular protein fractions of bacteria (Figure 2c). Immunofluorescence microscopy confirmed the specific binding of anti-InlA antibody (MAb-2D12) to the surface of L. monocytogenes cells, but it did not react with L. innocua (Additional file1: Figure S1). Western blot analysis showing reaction of anti-InlA antibody (MAb-2D12) to bacterial cell wall proteins. (a) Coomassie blue-stained SDS-PAGE (10 %) gel and corresponding Western blot. (b) Western blot with proteins from all 13 serotypes of L. monocytogenes. (c) Distribution of InlA in cell fractions (4b; F4244): supernatant, cell wall, and intracellular. MAb-3F8 showed a strong reaction with a single protein band of ~30 kDa (p30) from all Listeria spp. with the exception of L. welshimeri (Figure 3a). In addition, this MAb showed strong reactions with protein preparations from all 13 serotypes of L. monocytogenes (Figure 3b). Western blot showing reaction of MAb-3F8 with cell wall proteins from (a) Listeria spp. and (b) serotypes of L. monocytogenes . Proteins were resolved by SDS-PAGE (15 %) before immunoblotting. MAb-3F8 reactive protein (p30) is a 30-kDa protein present in all Listeria spp. PMBs with MAb-2D12 had higher capture efficiency than those with MAb-3F8. Using the same antibody, the smaller-sized (1-μm) MyOne beads displayed significantly higher capture efficiency than the Dynabeads M-280 (2.8 μm) for L. monocytogenes 4b (F4244) and L. ivanovii (ATCC19119) (Table 1, Figure 4). The capture efficiency curve with different concentrations of L. monocytogenes cells (103–108 CFU/mL) was bell-shaped; the highest capture (peak) was obtained at 105 CFU/mL, while the lowest capture was obtained at concentrations of 103 CFU/mL and at 107–108 CFU/mL (Figure 4). At initial L. monocytogenes concentrations of 104, 105, and 106 CFU/mL, MyOne-2D12 captured 33.5%, 49.2%, and 42.3% of cells, respectively, while M-280-2D12 captured 15%, 33.7%, and 14.2%, respectively. These values were significantly different (P < 0.05) from MAb-3F8 conjugated to MyOne or M-280 (Table 1). A similar trend was seen for L. ivanovii, but the values obtained were lower than those for L. monocytogenes. Therefore, the capture efficiency depends on antibody performance, bead size, and initial bacterial concentration. aBacteria were grown in TSB-YE for 18 h at 37 °C. The data are average of 3 experiments analyzed in duplicate. Values labeled with different letters (A, B, C, D or a, b, c, d) in a row or in a column are significantly different at P < 0.05. (a) Capture efficiency of MAb-coated paramagnetic beads from a cell suspension containing variable concentrations of L. monocytogenes . Data are the mean ± SD of three independent assays performed in duplicate. (b) Photomicrograph showing capture of GFP-expressing L. monocytogenes using MyOne-2D12 (anti-InlA MAb). Beads, red arrow; bacteria, blue arrow; bar = 1 μm. All subsequent IMS experiments were performed using MyOne beads. The fluorescence microscopic image in Figure 4b shows the capture of L. monocytogenes by MyOne-2D12. The capture efficiency of MyOne-2D12 and MyOne-3F8 was evaluated with bacteria grown in the recommended enrichment broths, LEB or FB. MyOne-2D12 showed significantly higher (P < 0.05) capture of L. monocytogenes and L. ivanovii than other Listeria spp., and the capture efficiency was similar for LEB or FB (Figure 5). The capture efficiency for MyOne-2D12 was comparable for the L. monocytogenes serotypes tested, including 4b (36.9%), 1/2a (27%), and 1/2b (28%), as well as for a strain of L. ivanovii (21.6%), and negligible capture of other Listeria spp. was observed (Figure 5a). 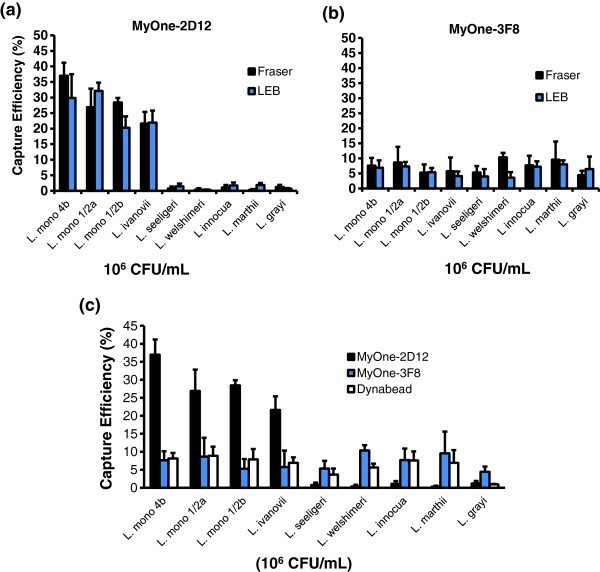 MyOne-3F8 displayed similar capture efficiency for all Listeria spp. tested, irrespective of the enrichment broths used (Figure 5b). When the capture efficiency of MyOne-2D12, MyOne-3F8, and Dynabeads anti-Listeria was compared against a Listeria panel, MyOne-2D12 captured the most pathogenic Listeria. For all other Listeria spp., both MyOne-3F8 and Dynabeads anti-Listeria had similar values (Figure 5c). Thus, MyOne-2D12 is highly specific for the capture of pathogenic Listeria, and MyOne-3F8 and Dynabeads anti-Listeria displayed similar capture efficiency for all Listeria spp. tested. Capture efficiency and specificity of (a) MyOne-2D12 (InlA); (b) MyOne-3F8 (p30); and (c) MyOne-2D12 (InlA), MyOne-3F8 (p30), and Dynabeads anti- Listeria (Dynal). Bacteria were grown in FB or LEB, and the capture efficiency was determined using a bacterial concentration of ~106 CFU/mL. Data are the mean ± SD of three independent experiments. The capture efficiency of PMBs for L. monocytogenes in a co-culture with L. innocua was also determined (Figure 6). The bacteria were grown in FB, mixed (1:1; 100 μL) in PBS to achieve concentrations of ~1 × 105 CFU/mL each and the capture efficiency was determined by plating followed by BARDOT-based colony identification. MyOne-2D12 captured ~104 CFU/mL (9.5%) of bacteria, of which most colonies (~80%) were confirmed to be L. monocytogenes by BARDOT (Figure 6a, Additional file2: Figure S2). MyOne-3F8 captured ~2.1 × 103 cells (2.75%), and ~50% were confirmed to be L. monocytogenes. Dynabeads anti-Listeria captured ~2.9 × 103 CFU/mL (3.3%), of which 40% were L. monocytogenes. (a) Capture efficiency of MyOne-2D12 (InlA), MyOne-3F8 (p30), and Dynabeads anti- Listeria from a mixed culture of L. monocytogenes and L. innocua in PBS. Data are the mean ± SD of three independent assays ± SD. Samples were validated by BARDOT. (b) Capture efficiency of PMBs from hotdogs inoculated with L. monocytogenes (Lm) and L. innocua (Linn) and enriched in FB. (c) Capture efficiency of PMB from soft cheese inoculated with L. monocytogenes and L. innocua and enriched in FB. Samples (b,c) were validated by both BARDOT and real-time qPCR. Capture efficiency (%) are the mean of three independent assays performed in duplicate. We also investigated the capture efficiency of bacteria from inoculated food matrices. Hotdogs were inoculated with ~10 CFU/g each of L. monocytogenes 4b and L. innocua as a mono- or co-culture and enriched for 18 h at 37°C. MyOne-2D12 showed higher capture of L. monocytogenes (12%) than L. innocua (1%) in the monocultures, but in the co-culture experiment the total bacterial capture dropped to 3.5%. MyOne-3F8 captured 3.7% of the L. monocytogenes cells in the monoculture experiment, while the commercial Dynabeads anti-Listeria captured only 1.8% (Figure 6b). Dynabeads anti-Listeria also captured a numerically (not statistically) higher percentage of L. innocua (4.2%) compared with L. monocytogenes (1.8%) (Figure 6b). Overall, these data show that MyOne-2D12 captured 10-fold more L. monocytogenes than L. innocua, while MyOne-3F8 captured 1.5-fold more L. monocytogenes than L. innocua. Dynabeads anti-Listeria had the highest capture efficiency for L. innocua from hotdogs. The capture of Listeria was also investigated with soft cheese made from goat’s milk in a co-culture experiment (Figure 6c; Additional file2: Figure S2). Cheese samples were inoculated with L. monocytogenes 4b (~27 CFU/g) and L. innocua (32 CFU/g) and enriched in FB for 18 h until the total count reached ~1.7 × 108 CFU/mL. The bacterial capture using MyOne-2D12 was 4.67 ± 0.46%, while MyOne-3F8 (0.37%) and Dynabeads anti-Listeria (1.2%) showed significantly (P < 0.05) lower capture efficiency (Figure 6c and Additional file2: Figure S2a). Capture of L. monocytogenes colonies on BHI agar plates was verified by a light-scattering sensor, with L. monocytogenes and L. innocua producing distinct scatter patterns (Additional file2: Figure S2b). The specificity and limit of detection (LOD) of the fiber optic sensor were analyzed by using MAb-2D12 as capture antibody and Cy5-labeled MAb-2D12 as a reporter. The sensor generated strong signals against L. monocytogenes and L. ivanovii, with a maximum signal of 22,560 pA. In contrast, non-pathogenic Listeria produced a maximum signal of 3,000–4,200 pA (Figure 7a), and non-Listeria bacteria, including Salmonella Typhimurium; E. coli O157:H7; and background food contaminant isolates, Staphylococcus aureus, S. epidermidis, Enterobacter cloacae, and Lactococcus lactis, produced signals of ~2,500 pA (Figure 7b). Similar results were obtained when MAb-3F8 was used as the capture and MAb-2D12 as the reporter molecule (Figure 7a,b). In the mixed cultures containing L. monocytogenes, L. innocua, and E. coli O157:H7 (~106 CFU/mL of each), the signals for MAb-2D12 and MAb-3F8 were 15,440 ± 1,764 pA and 8,440 ± 569 pA, respectively, which were significantly (P < 0.05) higher than the values obtained for L. innocua (2,725 ± 2,227 pA) or E. coli (1,589 ± 662 pA) alone (Figure 7b). The background control (PBS only) values ranged from 504– 650 pA. Therefore, both fiber-optic sensor configurations, 2D12–2D12 and 3F8–2D12, are highly specific for pathogenic Listeria, and specificity was contributed primarily by anti-InlA MAb-2D12. Other combinations did not produce satisfactory results (data not shown). Determination of specificity (a, b) and detection limit (c, d) of the fiber-optic sensor using MAb-2D12 (InlA) or MAb-3F8 (p30) as capture antibody and Cy5-conjugated anti-InlA MAb-2D12 as a reporter against (a) Listeria spp. and (b) other bacteria. Culture concentrations were 108 CFU/mL (or ~106 CFU/mL for mixed-culture experiments). Detection limit of the fiber-optic sensor using (c) MAb-2D12 and (d) MAb-3F8 as capture and MAb-2D12 as a reporter against different concentrations of L. monocytogenes or L. ivanovii. Signals (pA) are the mean of three fibers at 30 s.
The LOD was also evaluated by using pure cultures of L. monocytogenes and L. ivanovii serially diluted in PBS (Figure 7c and7d). Using MAb-2D12 as the capture molecule, the signals increased proportionately as the bacterial concentration increased until a cell concentration of 1 × 106 CFU/mL was reached, which gave the maximum signal (22,560 pA), almost reaching the threshold of the Analyte 2000 fluorometer. The lowest cell concentration that was considered positive (within the detection limit) was 3 × 102 CFU/mL for L. monocytogenes (6,252 ± 1,213 pA) and 1 × 103 CFU/mL for L. ivanovii (8,657 ± 4,019 pA). These values were at least 2-fold higher than those produced by the samples with 101 cells or PBS (blank). When MAb-3F8 was used as capture antibody, the LOD for L. monocytogenes (16,156 ± 6,382 pA) and L. ivanovii (13,882 ± 5,250 pA) was ~1 × 105 CFU/mL (Figure 7d). Bacteria captured by MyOne-2D12 or MyOne-3F8 were detected by the MAb-2D12-coated fiber-optic sensor (with MAb-2D12 as a reporter) and yielded signals of 18,230 ± 1,840 pA and 13,280 ± 2,890 pA, respectively (Figure 8). The MAb-3F8 fiber optic sensor (with MAb-2D12 as a reporter) produced signals of 11,225 ± 2,860 pA and 8,890 ± 1,900 pA, respectively (Figure 8a). The fiber optic signal value for MyOne-2D12 and -3F8 captured L. monocytogenes was about 2 to 3-fold higher than the signals obtained from the LOD concentrations (3 × 102 CFU/ml) (Figure 7). These data indicate that L. monocytogenes detection using MAb-2D12 for IMS and a fiber optic sensor gave better results compared with those obtained using MAb-3F8. Fiber-optic-based detection of L. monocytogenes after immunomagnetic capture with MyOne-2D12 or MyOne-3F8 from (a) buffer, (b) soft cheese, or (c) hotdog samples. (a) Fibers were coated with MAb-2D12 and 3F8. (b, c) Fibers were coated with MAb-2D12 only. Cy5-conjugated MAb-2D12 was used as a reporter in all experiments. Data (signals; pA) are the mean of 3 fibers. Bars marked with different letters are significantly different (P < 0.05). Blank, PBS only. In soft cheese-containing co-culture of L. monocytogenes and L. innocua, both MyOne-2D12 and MyOne-3F8 captured bacteria and produced signals of 13,026 ± 2,710 pA and 12,620 ± 4,554 pA, respectively (Figure 8b). Bacteria captured with Dynabeads anti-Listeria gave the lowest fiber-optic signals (Figure 8b). In Listeria-inoculated hotdog samples, only MyOne-2D12 was used for IMS and assayed by fiber optic sensor. The signal from the sample containing both L. monocytogenes and L. innocua was 8,376 ± 2,448 pA, while that from L. monocytogenes- and L. innocua-inoculated food was 8,552 ± 4,363 pA and 2,549 ± 1,358 pA, respectively (Figure 8c). For both food samples, the fiber optic signal values for MyOne-2D12 and -3F8 captured L. monocytogenes but not the L. innocua were higher than the signals obtained from the LOD cell concentrations (3 × 102 CFU/ml) (Figure 7). Therefore, the IMS and fiber optic sensor can be used together for detection of L. monocytogenes from enriched food samples, even in presence of L. innocua or other bacteria. Real-time qPCR targeting hly A was used to quantify PMB-captured Listeria from hotdogs and goat’s cheese artificially contaminated with L. monocytogenes and L. innocua (Table 2). When IMS was applied to the cheese samples followed by qPCR, MyOne-2D12 showed cell counts that were 4 times higher than those of MyOne-3F8 and Dynabeads anti-Listeria. In hotdog samples, MyOne-2D12 produced cell counts that were 2–3 times higher than those of the other 2 types of beads. aqPCR analysis is based on hlyA. Primers to 16S gene sequences were used as internal control. bData are average of 3 experiments run in triplicate. Values labeled with letters (A, B) in a column are significantly different at P < 0.05. The recovery of low numbers of target pathogens from complex food matrices is a challenge for sensitive detection methods[31, 32]. IMS using PMBs is used to separate and concentrate target pathogens from food samples before detection by plating, immunoassay, PCR, or biosensor methods[31, 37, 39, 42, 45, 51]. Antibodies or alternative molecules[19, 51, 52] are used as capture molecules for IMS, and improvements in reagents and assay platform development are essential to enhance assay performance. The specific detection of whole cells of L. monocytogenes using immunological methods relies on highly specific antibodies with a strong affinity for bacterial surface antigens. The antigen target should be uniformly distributed on the target organism, covalently anchored to the cell wall, and accessible to the antibody. InlA is a well-characterized protein that is highly specific to L. monocytogenes and L. ivanovii, and it has all the desirable properties of an antigen. Thus, we produced MAbs against InlA (pathogenic Listeria) and p30 (all Listeria spp.). The resulting MAbs were employed in IMS to capture and concentrate bacteria from food followed by fiber-optic sensor-based detection. To the best of our knowledge, this is the first demonstration of the combined use of these two approaches. InlA-specific antibody production was facilitated by the use of whole cells of L. monocytogenes and purified rInlA as immunogens. Hybrid B-lymphocyte clones secreted antibodies with a strong reaction towards live whole cells, but a weaker reaction was observed with heat-killed cells (data not shown). Since rInlA was soluble, denaturing agents were not required before immunization. Thus, the native structure of InlA during the immune response was preserved, and the resulting antibody recognized the native protein on the surface of bacteria. The InlA-specific MAb-2D12 reacted with all known L. monocytogenes serotypes, whereas previously reported MAbs failed to recognize all 13 serotypes[23, 26, 27]. Only serotype 1/2c showed a weak reaction with MAb-2D12. However, this strain has been involved in a few sporadic cases of listeriosis[54, 55] and is rarely found. Moreover, none of the 25 strains of serotype 1/2c expressed a functional, full-length InlA, which may explain why MAb-2D12 displayed a reduced reaction to 1/2c. When tested with serotype 3c, MAb-2D12 reacted strongly with a ~66 kDa band instead of the normal 80-kDa InlA band. The smaller band may represent truncated InlA, which results from inlA mutation. Generally, such strains are less invasive and are less likely to cause systemic infection as confirmed in animal models. We also generated a Listeria species-specific MAb by immunization with whole cells of L. monocytogenes. MAb-3F8 (IgM subclass) reacted with a ~30-kDa protein (p30) present in all eight Listeria species. Therefore, MAb-3F8 may aid tracking of Listeria contamination in foods or the food-production environment. The separation of target organisms following primary enrichment using IMS is faster than using selective secondary enrichment. Thus, we performed IMS using two different sizes of commercial beads. Antibody-coated 1-μm MyOne T1 exhibited significantly higher capture efficiency than the 2.8-μm M-280 beads (Table 1, Figure 4). Similarly, Foddai et al. used six different magnetic beads, including the two types used in this study, to capture Mycobacterium avium. MyOne displayed better capture efficiency than that of M-280, but the overall capture efficiency was low (<10%). In the present study, the capture efficiency for MyOne-2D12 and M280-2D12 was 49.2% and 33.7% (initial concentration used, 105 CFU/mL), respectively while 16.6% for MyOne-3F8 and 8.5% for M280-3F8. Paoli et al. used M-280-coated scFv antibody to ActA and reported a maximum capture of 19% for L. monocytogenes. Walcher et al. reported a capture range of 46%–122% using a bacteriophage endolysin specific for Listeria spp. coated on M-280; however, the long capture incubation time (2 h) may have allowed bacterial growth, thereby producing a higher capture rate. Furthermore, the binding of bacteriophage to host cells is an irreversible process, which may lead to higher capture efficiency than with antibody-coated PMBs. Koo et al. used Hsp60-coated M-280, which showed a capture efficiency for L. monocytogenes of 1.8%–9.2%. The capture efficiency also depended on the initial bacterial concentration. The highest capture (peak) with MyOne-2D12 or MyOne-3F8 was seen at a bacterial concentration of 105 CFU/mL (Figure 4). This is important for meaningful comparisons to be made between the performances of IMS in different studies, which may use a wide range of initial bacterial concentrations. Collectively, IMS data indicate that beads with a smaller diameter (1-μm MyOne) have better capture efficiency than larger beads (2.8-μm M-280) due to higher surface area to mass ratio and smaller beads can bind more antibody per mg of beads (20 μg biotinylated antibody for MyOne vs. 10 μg for M-280) (Invitrogen). Furthermore, the antibody affinity, the distribution/expression of antigens on the surface of bacteria, and the initial bacterial concentration also significantly affect capture efficiency[14, 58]. Here, the abundant expression of InlA on the surface of L. monocytogenes cells coupled with the use of smaller sized PMB was most likely responsible for increased capture efficiency. However, the assay performance may be affected if PMB followed by fiber optic sensor was applied to food samples directly without an enrichment step. In such situation, food matrices may affect bacterial antigen expression or antibody affinity. We tested the capture efficiency of L. monocytogenes in a co-culture experiment in buffer or food. Food contaminated with L. monocytogenes may contain other Listeria spp. and background competitive microflora[16, 50]. L. monocytogenes grows slowly and is a poor competitor; hence, lower cell numbers are expected in food samples. In a mixed population, L. monocytogenes may be outgrown by other species of Listeria during enrichment[17, 18, 21, 33]. Here, IMS using MyOne-2D12 efficiently captured L. monocytogenes, in the presence of L. innocua while both MyOne-3F8 and Dynabeads anti-Listeria captured more L. innocua cells than L. monocytogenes (Figure 6). Furthermore, the capture efficiency for MyOne-2D12 using a co-culture in buf-fer or food varied from 4.7%–12.3% (Figure 6 and Additional file2: Figure S2). Less than optimal level of capture was attributed largely to the presence of higher initial concentrations of bacteria (107–108 CFU/mL) in the sample and the presence of interfering agents (inhibitors) in food matrices, particularly in soft cheese. Furthermore, the increased capture of L. monocytogenes in hotdog compared to PBS was possibly due to increased expression of MAb-2D12-reactive antigen (InlA) during enrichment while cells used in PBS were originally cultured in BHI, which may have caused reduced InlA expression resulting in reduced L. monocytogenes capture (Figure 6). L. ivanovii is an opportunistic human pathogen that is associated with gastroenteritis and bacteremia in humans[13, 59]; therefore, the development of methods to detect this pathogen is also essential. MAb-2D12 reacted with L. ivanovii, which was successfully detected by using IMS and a fiber-optic sensor. Hearty et al. reported the InlA-specific MAb-2B3; however, this antibody was unable to detect L. ivanovii in their assay setup. MAb-2B3 may be specific for an epitope of InlA on L. monocytogenes that is absent on L. ivanovii. PMB-captured cells were also identified by BARDOT and qPCR. BARDOT is a light-scattering sensor that detects and identifies bacterial colonies on agar plates with a high degree of precision in minutes, since each species has a distinctive scatter-fingerprint signature. BARDOT allowed quantitative estimation of capture rate for L. monocytogenes and L. innocua on BHI or MOX plates (Additional file2: Figure S2) instantly based on colony scatter patterns and it is easy to perform without the requirement for any additional reagents or probes. Real-time qPCR confirmed that L. monocytogenes capture and detection from food by MyOne-2D12 was 13%–16%, which is significantly higher than that by MyOne-3F8 and Dynabeads anti-Listeria (3%–6%). These estimations are slightly higher than the plate count and the light-scattering data obtained in this study. Yang et al. used nanoparticles for IMS and showed better capture and detection of L. monocytogenes in milk with real-time PCR (9%) compared with plate counts (6%). This may be because qPCR detects DNA from nonviable or viable but non-culturable cells, which may not otherwise be detected by traditional plating methods[62, 63]. The fiber-optic sensor operates based on the principles of antibody-antigen interaction and is marketed by Research International. It is currently used for foodborne or biothreat agent detection. The antibody (MAb-2D12) used in this study on the optical waveguide made the assay highly specific for L. monocytogenes and L. ivanovii, with the detection limit of 3 × 102 CFU/ml, a significant improvement over previous reports. Geng et al. used MAb-C11E9 to show cross-reaction with some L. innocua strains with LOD of 4.3 × 103 CFU/ml. Using a polyclonal anti-Listeria capture antibody and an InlA-specific aptamer as a reporter, Ohk et al. reported specific detection of L. monocytogenes with a LOD of 103 CFU/mL. We developed highly specific anti-InlA MAb (2D12) against pathogenic Listeria: L. monocytogenes and L. ivanovii and anti-p30 MAb (3F8) against all Listeria spp. including the two new species (L. marthii and L. rocourtiae). Anti-InlA antibody allowed specific detection of low levels (3 × 102 CFU/ml) of L. monocytogenes and L. ivanovii when used on IMS and a fiber-optic sensor in the presence of other bacteria from buffer, soft cheese or hotdogs inoculated with low levels of cells (10–40 CFU/g) following enrichment. All bacterial cultures (Additional file3: Table S1) were maintained on brain heart infusion (BHI; Acumedia, Lansing, MI) agar plates at 4°C with the exception of lactic acid bacteria, which were maintained on de Man Rogosa Sharpe agar (MRS; Becton Dickinson [BD], Sparks, MD). To obtain fresh cultures, Listeria spp. were grown in tryptic soy broth (TSB; BD) containing 0.6% yeast extract (TSB-YE) or Listeria enrichment broth (LEB; BD) at 37°C for 16–18 h. Non-Listeria organisms were grown in TSB-YE, and lactic acid bacteria were grown in MRS broth at 37°C for 16–18 h. Fraser Broth (FB) and modified Oxford agar (MOX) were purchased from BD. All bacteria were maintained in BHI broth with 20% glycerol at −80°C until further use. Specific primers (MWG-Biotech, Huntsville, AL) were designed to target the inlA gene (GenBank acc. no. : DQ132795) using Vector NTI 10.0 software (Invitrogen) in order to amplify the complete open reading frame (2331 bp) except for the signal peptide and a C-terminal portion. To insert the inl A gene into the pAE expression vector, the restriction sites for Bam HI and Kpn I enzymes were incorporated into the forward primer, For-inlA (5′-CGGGATCC GTATGGATTAACACGA-3′) and reverse primer, Rev-inlA (5′-GGGGTACC CTAAGTAAGAACCATTGCAGT-3), respectively. The inl A ORF was amplified from the genomic DNA of L. monocytogenes (ATCC 19114) by PCR using an Eppendorf thermocycler (Mastercycler EP gradient S) with the following standardized conditions 94°C for 7 min, 94°C for 1 min, 45°C for 1 min, 68°C for 2 min, and a final extension of 68°C for 7 min. The amplicon was digested with Bam HI and Kpn I and ligated into pAE—predigested with the same enzymes—using T4 DNA Ligase (Invitrogen). The pAE-inl A construct was electrotransformed into Escherichia coli Top10 (Invitrogen), the recombinant clones were selected on LB agar containing ampicillin (100 μg/mL), and insertion of inlA (pAE-inlA) was confirmed by sequencing. The pAE-inlA plasmid was transformed into E. coli BL21(DE3) pLysS (Invitrogen) competent cells. The transformed cells were grown to reach the log phase (OD600 = 0.5–0.7) and induced with 1 mM IPTG for 3 h at 37°C. Cells were harvested, suspended in lysis buffer (100 mM NaH2PO4, 10 mM Tris HCl, and 20 mM imidazole; pH 8.0) and sonicated (3 cycles using a Branson Sonifier). The recombinant InlA (rInlA) containing a poly-histidine tag (6×-His) was purified by using a Ni-NTA affinity chromatography system (GE Healthcare, Piscataway, NJ). Finally, column-eluted proteins were dialyzed against 0.02 M phosphate buffered saline (PBS; pH 7.2) for 24 h and concentrated with polyethylene glycol (MW 20,000). Six-week-old BALB/c female mice were administered intraperitoneally (i.p.) with approximately 1 × 108 cells/mL of heat-killed L. monocytogenes serotype 4b diluted in PBS and mixed (1:1) with complete Freund’s adjuvant (CFA). Two weeks later, a mixture of heat-killed L. monocytogenes and 50 μg of rInlA prepared with incomplete Freund’s adjuvant (IFA) was administered i.p. every week for 8 weeks. Four days before the last immunization, the mouse showing the highest antibody titer against rInlA in an indirect ELISA received booster immunizations with rInlA via both intravenous and i.p. routes. The splenocytes were harvested from the mouse and fused with murine Sp2/O-Ag14 myeloma cells in the presence of 50% (w/v) PEG 1450 (Sigma) as described previously. Selected hybridoma clones were administered to pristane-primed mice to produce ascitic fluid for antibody production(28). MAbs were purified by affinity chromatography using a protein A-Sepharose 4B column (GE Healthcare), and the class and subclass of each MAb were determined by ELISA using a Mouse Subisotyping Kit (Sigma). Indirect ELISA was performed to determine the reactivities of MAbs with live bacterial cultures adjusted to OD600 = 1 (approx. 109 CFU/mL) in 0.1 M sodium carbonate coating buffer (pH 9.6) or with rInlA (10 ng/well) for 16 h at 4°C, and immunoassay was carried out as described previously. Bacterial proteins were prepared according to the published method with some modifications. For isolation of cell wall-associated proteins, 100 mL of cultures grown for 18 h were centrifuged (7000 × g for 10 min), and the cell pellets were resuspended by gently pipetting up and down with 250 μL of protein extraction buffer (0.5% SDS, 10 mM Tris; pH 6.9) followed by incubation at 37°C for 30 min. After centrifugation (16,100 × g for 10 min at 4°C), the supernatants were collected. The remaining cell pellets were resuspended in sample solvent (4.6% SDS, 10% β-mercaptoethanol, 0.124 M Tris, and 20% glycerol; pH 6.9), sonicated four times for 15 s each (Branson Sonifier), and centrifuged (16100 × g for 20 min at 4°C) to collect the supernatant (representing intracellular protein fractions). Protein concentrations were adjusted using the bicinchoninic acid assay (BCA; Pierce) and separated by SDS-PAGE (10% or 12% acrylamide; Bio-Rad, Hercules, CA). The proteins were blotted onto Immobilon-P membranes (Millipore, Bedford, MA) and blocked with 5% skimmed milk for 1 h at room temperature (RT). The membranes were washed with PBST (PBS containing 0.05% Triton X-100), immunoprobed sequentially with the MAbs, and incubated with HRP-conjugated goat anti-mouse polyvalent antibody (Sigma). Antibody-reactive bands were visualized following treatment with a chemiluminescence substrate system (ECL kit; Thermo Fisher Scientific, Rockford, IL) or DAB (6 mg of 3.3′-diaminobenzidine tetrahydrochloride; 10 μL of H2O2, 30%; 9 mL of 50 mM Tris–HCl, pH 7.6; 1 mL of 0.3% NiCl2). Two MAb-producing clones were selected for further study: L. monocytogenes (InlA-reactive)-specific MAb-2D12 and Listeria genus-specific (p30-reactive) MAb-3F8. L. monocytogenes (serotypes 4b, 1/2a, 1/2b, and 4d) and L. innocua cell pellets (grown in 10 mL of LEB) were washed twice with PBS and resuspended in 1 mL of PBS containing 5% bovine serum albumin (PBS-BSA). Subsequently, 20 μL of cells were incubated with MAbs diluted in 500 μL PBS-BSA for 1 h at 37°C. After washing with PBS (2×), the cell pellets were resuspended in 250 μL of FITC-conjugated goat anti-mouse IgG (1:100; Sigma) and incubated at 37°C for 1 h. After three sequential washes with PBS, the pellets were stained with Hoechst 33258 (for nuclear staining) for 15 min, and a single drop of the suspension was examined using an epifluorescence microscope (Leica, Buffalo Grove, IL). For use with a fiber-optic sensor and magnetic beads that are pre-coated with streptavidin, affinity-purified antibodies were biotinylated using the EZ-Link Sulfo NHS-Biotinylation Kit (Pierce) as per the manufacturer’s instructions. The biotinylated MAbs were tested by ELISA in avidin-coated microtiter plates, and the ratio of biotin incorporated into the MAbs was calculated using the HABA assay (4′-hydroxyazoben-zene-2-carboxylic acid; Pierce). For use with a fiber-optic sensor, MAbs were also labeled with Cy5 using the Cy5-Ab labeling kit (Amersham Biosciences) as per the manufacturer’s protocol. Two different sizes of PMBs were used: Dynabeads M-280 Streptavidin (2.8-μm diameter) and MyOne streptavidin T1 (1.0 μm-diameter) (Invitrogen). Bead preparation involved mixing the streptavidin-coupled PMBs with 200 μg/mL of biotinylated MAbs for 30 min under constant rotation at RT. The unbound biotinylated MAbs were separated by removing the PMBs with a magnetic particle concentrator (MPC-S; Invitrogen), followed by washing the beads three times with PBS containing 1% BSA. The beads were stored at 4°C until use. To determine PMB-based capture with pure cultures, bacterial cultures grown for 18 h were washed twice with PBS and resuspended in PBS containing 0.1% BSA. Subsequently, 20 μL of MAb-coated PMBs was added to 200 μL of bacterial cell suspension containing variable cell counts (103 to 108 CFU/mL) and mixed in a rotary incubator for 30 min at RT. PMBs were recovered using MPC-S, washed 3 times using 1 mL of PBST, and resuspended in 200 μL of PBS. Finally, PMBs were subjected to vigorous vortexing to release the captured bacteria and 100 μL of each suspension was surface-plated onto BHI or MOX agar plates for enumeration. In some experiments, Dynabeads Anti-Listeria (Invitrogen) were used in parallel as a control. The capture efficiency (CE) was calculated as follows: CE (%) = Cb/Ci × 100, where Cb is number of cells bound to beads (CFU/mL) and Ci is the initial total number of cells present in the sample (CFU/mL). To verify PMB-based capture of Listeria from food matrices, we inoculated 10 g of each RTE soft cheese made from goat’s milk and hotdogs (purchased from local grocery stores in West Lafayette, IN) with L. monocytogenes and L. innocua (10–40 CFU/g) and incubated the samples for 15 min at 25°C. The samples were placed in stomacher bags built with an interior filter lining (Whirl-Pak; Nasco, Fort Atkinson, WI) and 90 mL of FB or LEB was added to each bag, blended for 2 min in a stomacher, and incubated at 37°C for 18 h. Uninoculated food samples served as negative controls. A total of 10 mL of each enriched culture was placed in a 15-mL tube, washed twice with PBST, and resuspended in 10 mL of PBST. Samples were diluted 10-fold in PBS, and IMS was performed as described above using 200 μL of the inoculated sample. The precise levels of inoculums and growth after enrichment were enumerated on BHI and MOX agar after 24 h or 48 h, respectively, at 37°C. Bead-captured bacteria were further tested by fiber-optic sensor, light-scattering sensor, and qPCR. Polystyrene waveguides (fibers) were cleaned and coated with 100 μg/mL of streptavidin (NeutrAvidin; Pierce) for 2 h at 4°C as described previously. Fibers were blocked with SuperBlock blocking buffer (Pierce) for 1 h and incubated overnight at 4°C with each of the biotinylated MAbs (200 μg/mL). The fibers were rinsed gently with PBST and then reacted with biotinylated-BSA (100 μg/mL; Pierce) for 1 h at RT to block unbound streptavidin sites. The antibody coated fibers could be stored at 4°C until use. The fibers were washed again in PBST and placed in reaction chambers containing 100 μL of freshly harvested bacterial suspensions (Table 1) at various concentrations (1 × 103 to 1 × 108 CFU/mL) and incubated for 2 h at RT. Following gentle washing with PBS, the fibers were exposed to Cy5-labeled anti-InlA antibody for 2 h at 4°C, washed with PBST, and signals were acquired with an Analyte 2000 Fluorometer (Research International Co., Monroe, WA). The fluorescence intensity signals were recorded for each fiber for 30 s. For each treatment, 3–5 waveguides were used, and mean values ± SD for each experiment were presented. An automated light-scattering sensor, BARDOT (BActerial Rapid Detection using Optical light-scattering Technology; Advanced Bioimaging Systems, LLC, West Lafayette, IN) was used to identify colonies of Listeria captured by IMS (described above) on BHI or MOX agar plates[19, 61]. This system collects scatter images of bacterial colonies (diameter, 1.3 ± 0.2 mm) through a diode laser (635 nm), and the bacteria were identified by comparing scatter images with library-stored images. Before conducting the food sample testing experiment, initial experiments were performed to determine the capture rate of IMS for L. monocytogenes and L. innocua, present at 106 CFU/mL each in a mixture in PBS, followed by BARDOT analysis. PMB-captured bacteria were also analyzed by qPCR. To eliminate PCR inhibitors, the DNA was purified from captured bacteria using the DNeasy Blood and Tissue Kit (Qiagen) by treating the PMB–bacteria complexes (100 μL) with 180 μL lysis buffer (20 mM Tris–HCl, pH 8.0; 2 mM sodium EDTA; 1.2% Triton X-100; 20 mg/mL lysozyme) followed by incubation at 37°C for 30 min. PMBs were removed from the solutions by using MPC-S (Invitrogen), and the supernatant was pipetted onto the columns. DNA was eluted in 100 μL of elution buffer and used for qPCR. 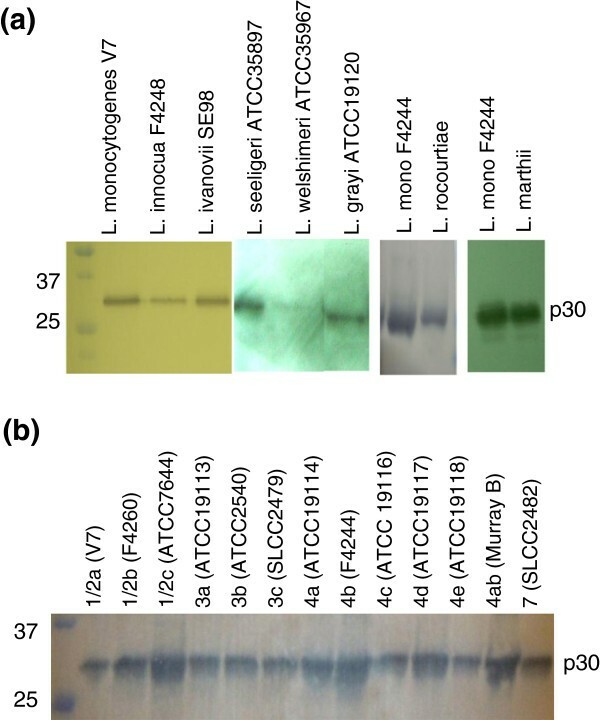 Primers specific for hly A (hlyA-For, 5′-TGCAAGTCCTAAGACGCCA-3′ and hlyA-Rev, 5′-CACTGCATCTCCGTGGTATACTAA-3′) of L. monocytogenes were used for detection. Primers for 16 s (Lis-16 s-For, 5′- CACGTGGGCAACCTGCCTGT-3′ and Lis-16 s-Rev, 5′- CTAATGCACCGCGGGCCCAT-3′) were used as an internal control. The qPCR was performed using Power SYBR Green Master Mix (Applied Biosystems, Foster City, CA) with 5 μL of DNA template in a 20-μL total reaction volume and analyzed in triplicate. PCR amplification was carried out in a StepOnePlus Real-Time PCR System (Applied Biosystems) under the following conditions: 1 cycle of 95°C for 10 min for denaturation, followed by 40 cycles of 95°C for 20 s, 58°C for 1 min, and 95°C for 1 min for the dissociation curve. To construct the standard curves, DNA from L. monocytogenes F4244 was quantified, and a serial dilution was prepared to produce a concentration curve. In all qPCR assays, the DNA templates of L. monocytogenes and L. innocua were used as internal controls. Bacterial cell counts were estimated based on the Ct values of unknown samples and compared with the standard curve. Data are expressed as the mean ± SD from at least three independent experiments performed in duplicate unless otherwise indicated. Mean values were compared by ANOVA using GraphPad Prism version 5.0 (GraphPad Software), and the differences in mean values were compared using Tukey’s multiple comparison test at P < 0.05. We thank Coordenadoria de Aperfeiçoamento de Pessoal de Nível Superior (CAPES) and Conselho de Desenvolvimento Científico e Tecnológico (CNPq) at Brazil project number 481179/2007-0, the agricultural Research Service of the U.S. Department of Agriculture project number 1935-42000-072-02G, and the Center for Food Safety and Engineering at Purdue University for the financial support. This project was conceived and designed by MM, FRC, WPS, JAGA, AKB; experiments were performed by MM, NLC, ANM; data were analyzed by MM, JAGA, AKB; and written by MM, JAGA and AKB. Graduate work of MM was supervised by JAGA and AKB. All authors read and approved the final manuscript.